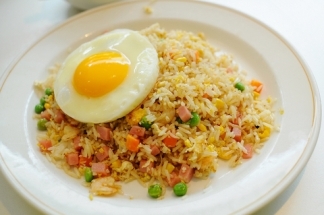 Fried Rice Recipe is the simplest recipe in Indonesian cooking. You can make it simple or extra with many side dishes. But you can simply add it with some cucumber and sambal, and they are simply delicious and very easy to make. Even if you have so little time, you can make this dish in 20 minutes. So how about that? It’s pretty fast isn’t it? Use rice steamer to make rice ready to baked. The best rice to make the dish is the old rice, from the day before for example. Heat the oil or butter in the wok, fry the eggs while you stir it continue. Set aside. Set the wok again on fire and add butter or vegetable oil, and add garlic and shallots. Stir it until fragrant. Add the red chilies and ham or bacon. Fry it until the bacon is done and fragrant. Add the rice, eggs and spring onions until the whole things are well coated. Add sweet soya sauce, salt, pepper, and chicken or meat bouillon powder. Stir it continuously until everything is well blended and heated. Serve with fried egg or add some cucumber and sambal, it's really delicious. Tips: You can also add green peas or chopped carrot into the dish to make it healthier. It’s also tasty.